Invisible support in your shoes. Thin, transparent gel cushion ideal for high-heeled shoes and sandals. 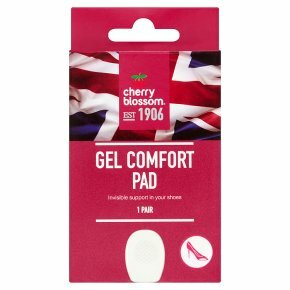 Gel Comfort Pad gives your feet added support and reduces friction over longer periods on foot in high-heeled shoes. Reusable. Directions: Peel the protective backing off and glue the cushion with the rounded side pointing towards the toes. If necessary, briefly wash under tap water to restore the cushion's adhesive strength.